Out team is builidng a quadplane, but it is a little hard for us to determine what kind of flight controller to use. Due to the airframe of quadplane in 'QgroundControl', we need to pick up one flight controllers among : Pixhawk 2.4.8, HKPilot32 and Pixhawk 4. This picture is our contorl system design if we just use the Pixhawk 2 or HKpilot 32. But I was wondering withether using pixhawk 4 flight controller can increase the stability to fly the quadplane? First determine from the list of Airframe Reference which one resembles the closest to what you want to build. Can you specify what airframe you're planning to use? 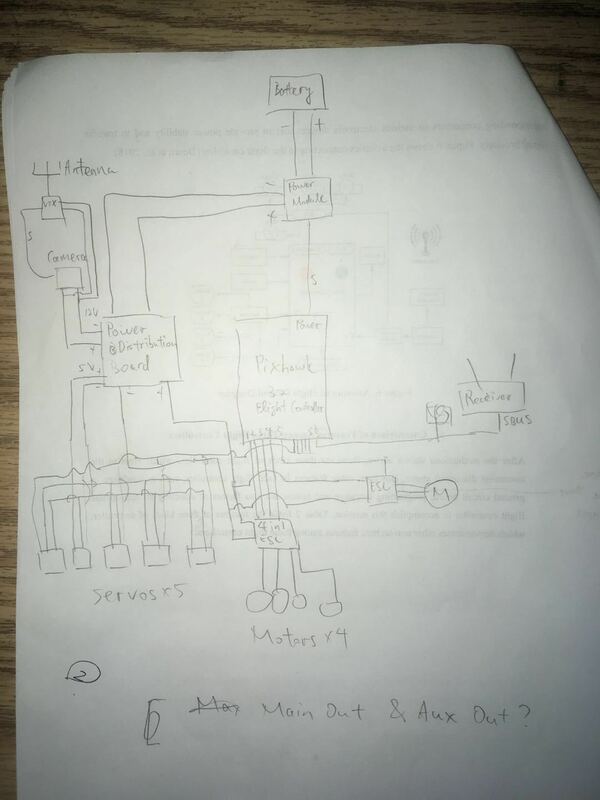 What do the six servos control? My QuadRanger conversion uses four servos for flight control and two PWM channels to control the camera gimbal Pitch and Yaw. If it's a V-Tail with elevons, ailerons and flaps, I'm guessing the Generic AAVVT v-tail plane airframe with Quad VTOL. Maintainer: Sander Smeets SYS_AUTOSTART = 13007 might be the closest? Either one of the above will work. Depending on the bootloader in the 2.4.8 and HKPilot, if it's version 4, it'll need to be upgraded to version 5 so that you can use the v3 of the PX4 stack which is over 1MB in size. The bootloader upgrade can be done through QGC which shouldn't be much of a problem. Basing on this instruction, we would like to use either the "Fun cub Quad Vtol" or "Quadranger" as the airframe for our quadplane. Therefore, we need to know whether the flight controller contains enough RAM to store the file of quadplane's airframe. In addition, since we are building a quadplane to drop a payload on the target, the other two channels need to used as the switch of dropping and the switch of flying-mode transition. We you said "version 4/5", do you mean the flying operation system or what else software in the flight controller? How can we upload to the version 5 by using the QGC? I pretty much did the same thing but did some modifications on the actual build to save some weight. You can see some of my build log photos and the progress of my QudRanger. If you use a FrSky SBUS Rx, you'll have 16 channels, which is more than plenty to cover everything you need to control. I have the same thing so the firmware can be configured to handle all of it. I was referring to the bootloader version of the Pixhawk. But as I mentioned earlier, any of the three you pointed out will work. I have a Zephyr 3 QuadPlane with the Pixhawk 2.4.8 that I've been working on and it has more than what I need for it. How can we upload to the version 5 by using the QGC?